Cholera is an infectious disease of intestine caused by taking contaminated food and water. 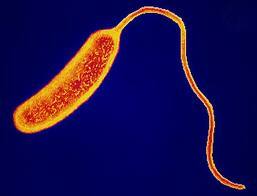 Cholera disease is caused by bacterium Vibrio cholerae. With short incubation period of 1 to 5 days, it produces enterotoxin, which can cause watery diarrhea and lead to dehydration. This can cause even death in case of improper cholera treatment. Vomiting occurs in most cholera patients. It is due to insufficient water absorption by the small intestine. Cholera leads to large amounts of water loss from the body. Cholera treatment is supported by taking large amount of water with sugar and salt dissolved in it. Cholera is generally not a tropical disease. Quality of our drinking water and hygiene standards are a matter of concern in cholera. In some severe cases hospitalization is necessary where a water loss is treated with a drip, which supplies necessary fluids to the bloodstream. People should take care of their hygiene and sanitation to fight against cholera epidemics.